Shazam! #1 review: The Seven Magic Lands – AiPT! Shazam unlocks a shocking secret deep within the Rock of Eternity which challenges everything he knows about the worlds of magic and his family’s future as its champions! Shazam! is an interesting beast. Originating in the Golden Age of comics as Captain Marvel, the character’s had a tricky history up until this point. Once the supreme champion of comicdom, surpassing Superman himself, the character’s seen a reduction in popularity over the years. It’s fascinating to look at that history, once you consider how much of a big deal the character once was. Many of the popular mechanics, some of which would go onto define a lot of the silver age, emerged first in Captain Marvel comics. Otto Binder and C.C. Beck really laid the foundations and created something fresh and few could have ever guessed the influential power of the work. Whether it be superhero families, supervillain teams, super pets, odds are, if you can name it, Captain Marvel did it first. Superman’s science-fiction met its match in Captain Marvel’s wondrous fantasy and magical possibility. Billy Batson was no typical superhero, he resided in the wild realm of suited up and intelligent talking tigers and evil space-worms. Which is why when Fawcett closed, DC made sure to hire Otto Binder to work on Superman. And he certainly brought that same sense of wonder and possibility to the Superman franchise, unveiling iconic element of mythology after another. So the prospect of a proper revamp in 2018 and a regular ongoing title for the character is really intriguing, especially with a massive film adaptation on the way. How do you recenter this once great icon and help him reclaim his status at the top of the hero pantheon? It’s a challenge many have taken on before and it is a tough nut to crack. Geoff Johns, who’s pretty much setup most of the mechanics for a good number of modern DC flagships, is perhaps a fitting choice to take up the baton once held by the likes of Otto Binder. Whether it be Green Lantern, Aquaman, Flash, JSA or Superman, Johns has always laid down firm groundwork and established clear story engines, proving himself to be adept at successfully revitalizing properties. 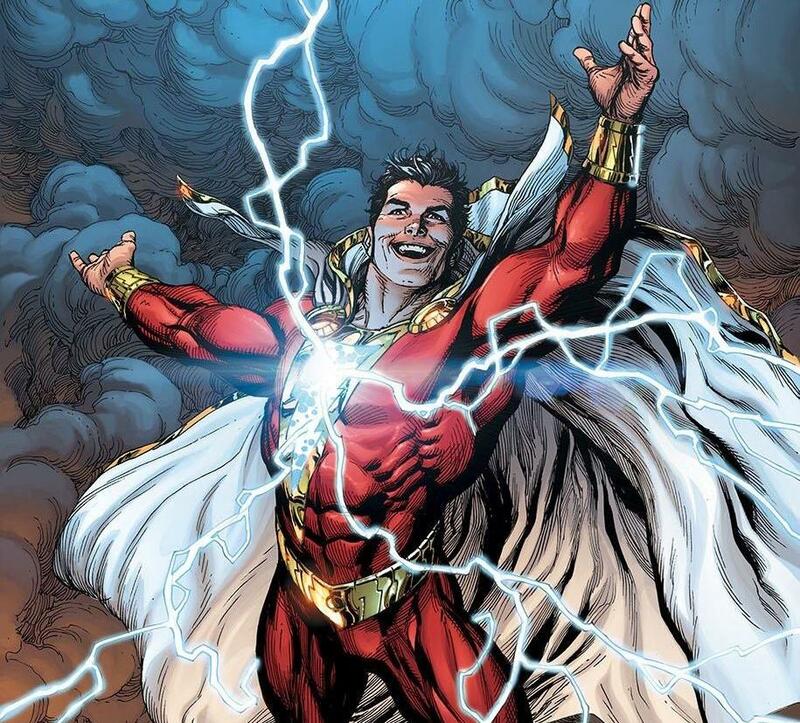 He has also done extensive work on pivotal antagonists of the Shazam! franchise over the years, most notably in 52, where he handled the families of both Black Adam and Doctor Sivana and utilized Mr. Mind. He also rebooted Billy Batson and the entire franchise alongside Gary Frank and Brad Anderson with the Curse of Shazam! backups during The New 52. This relaunch comes on the heels all of that and promises to be a rebirth, in spirit, of the franchise in order to build a definitive rendition of the character. Alongside artist Dale Eaglesham, his partner from JSA, colorist Michael Atiyeh and letterer Rob Leigh, Johns is really building a fun, accessible and all-ages story anyone can pick up. The first few images are that of train tracks and a train arriving, as they often are in Billy’s story. We open at the Rock of Eternity, as an omniscient narrator chronicles its history. From the seven champions it once housed to the seven sins that it once imprisoned, we are told of its cosmic importance and its need of a new champion. The creative team quickly recounts his new origin here in a lush spread full of detail and teases for what’s to come. We see seven thrones in the Rock of Eternity, each with its own unique insignia, as magical lightning zaps about. Only one is occupied, with the Wizard sitting solemnly, commenting on Billy. The jaded cynic Billy of the early New 52 is framed as a relic of the past here, with the team emphasizing his worthiness and love of family. If you’ve never read a Billy Batson story before, this could easily be your first. If you’re a returning reader, it’s a nice retelling that catches you up to speed. But beyond that, it’s also an effective statement of purpose, as the creative team sets up the core thesis statement of the run ahead. “For family is the true power of Shazam…and it’s true weakness.” Those are the words the narrator ominously concludes on and it’s apparent that they’re what the team means to explore. Dale Eaglesham’s artwork, in conjunction with Mike Atiyeh’s color-work, throughout the issue is stellar and excels especially in this opening sequence. Whether it be rusty old train tracks, Kirby-ian technology or fantastical old castles, made predominantly of stone and wood, Eaglesham makes them all work and makes them fit seamlessly into one lush setting. And the subtle allusions to give texture to the surroundings, from cracks in the stone to the way the fabrics of cloth are rendered, are all done with careful thought and aid the storytelling. Rob Leigh opts for a very fantastical title font to really establish the story and its intent: this is not just a regular superhero story. We then cut to a museum in Philadelphia where Billy and his foster brother, Freddie Freeman, are on a school trip. Their school bus is etched with the words Fawcett High School, a nice nod. As Freddie groans about boredom, crooks wearing masks with DC hero likenesses show up. It’s a charming little bit and one very much akin to the robbery scene in Spider-Man: Homecoming. The crooks make demands, only for Billy to say the magic word: Shazam! Emerging in his hero persona, Billy begins to make quick work of the crooks. The last remaining crooks hold hostages, which proves futile, since Freddie’s transformed and brought in the backup of the entire Shazam family. Mary Bromfield, Pedro Peña, Eugene Choi and finally Darla Dudley. Taking down the criminals is almost child’s play for the family of heroes and they make it evident, with Freddie and Pedro playing baseball with one crook as Darla ties up another with a fire hose. It’s a great, fun little introduction to the cast of the book and a cool showcase of their abilities. Later, we see the police taking the criminals into custody and we’re treated to a scene where the family debates who’s in-charge, with Mary noting they need code-names. Throughout the entire sequence, there’s a youthful exuberance and joy that accompanies every moment, with the kids loving every moment of their wondrous powers. And they’re very much kids. From there we move to their home, with the Vasquezs’, where they’re called down to dinner. They all come charging down, with fresh lasagna waiting for them. Freddie remarks that with great power comes shared responsibility, a fun play on the famous Spider-Man adage. Billy suggests to Freddie that perhaps he should called himself ‘Captain Marvel’ before being cut off. There’s a tongue-in-cheek sensibility to the book that’s very evident and you can tell the creative team’s having a lot of fun. The entire family then sits down to dig into their dinner, briefly discussing the events at the Museum. The Vasquezs, in classic tradition, remain unaware of their kids’ super-heroics and the kids speak with great passion in regards to the superhero team that saved the day. One thing that’s incredibly special, in both the above sequences at the museum and the Vasquez home, is just how much personality and character the creative team is able to squeeze into the room they’re given. Eaglesham’s art is especially vital to this, as he brings a kinetic power to the title, with his characters being incredibly expressive. Eaglesham is also a master of body language and his characters perform in ways that convey a lot about them. Every little mannerism adds up to inform and bring out their personalities, with some being hilariously exaggerated even. But it all works, the exaggerated effect suits the tone and sensibility of both the characters and the story being told. So from Pedro’s ridiculous batting stance, Mary’s pursed lips as she ponders superhero names, Rosa Vasquez’s patient but commanding posture, it all works. In each and every panel and page, Eaglesham is able to convey the core of the characters and what they’re feeling effortlessly. The visual storytelling is impeccable and it’s a huge part of why the book works the way it does. Freddie’s smug grins, Darla’s feverish excitement, Mary’s habit of twirling her hair and Pedro’s tic of prepping water as he’s taking the next bite of food, they all ground the characters and bring humanity to them, allowing us to engage with the wild and adventurous tone of the book and story. Every panel has a lot going on, with Eaglesham packing every bit of character that he possibly can into it. Atiyeh’s color palette clicks perfectly here, accentuating all the strengths of Eaglesham’s pencils. Following the dinner, we skip to the kids at the Rock of Eternity, where Billy professes his love for the family and how much they matter to him. Family is certainly the core thematic of the run here and it’s the fundamental idea on which everything is built. Eugene then pops in from a corner and informs them of a discovery he’s made. They chase after him and find a place that wasn’t there in the Rock until relatively recently–a train station. The Station, as Eugene calls it, is filled with many pathways, each with its own train and tracks, with a different symbol etched on top of the pathways. The symbols are the very same ones on the throne. The kids then come across a gigantic map, which reads “The Magic Lands!” and showcases a fantastical realm, one marked by these mysterious symbols and the classic Shazam! symbol. Moving back to the Vasquez home for a moment, we’re given pages that cut between the Rock and the home. There’s a knock on the main door and the two parents go to answer it. And at the same time, the kids discover a gigantic lever set to “Off” and Freddie, intending to turn the place on, pulls it to “On”. Lightning erupts and we cut to the door opening, leading us to the final page of the main story. We’re shown a man with a striking resemblance to Billy in his adult form, the same man we saw in Billy’s photograph of his parents. He explains that he’s Billy’s father and has come to see him. And thus the main story ends. It’s a solid hook and Johns is laying out fun mythology for readers and future writers to explore, much like he did on franchises like Green Lantern and Aquaman. In a lot of ways, Shazam! #1 is perhaps the most Geoff Johns comic in a long time. It’s filled with so many elements and trappings Johns historically has utilized or been a big fan of. From the six mysterious and unknown equivalents to the one we do know, adding up to a total of seven to the story deeply rooted in family, these are all things fans of Johns are intimately familiar with and have come to expect. 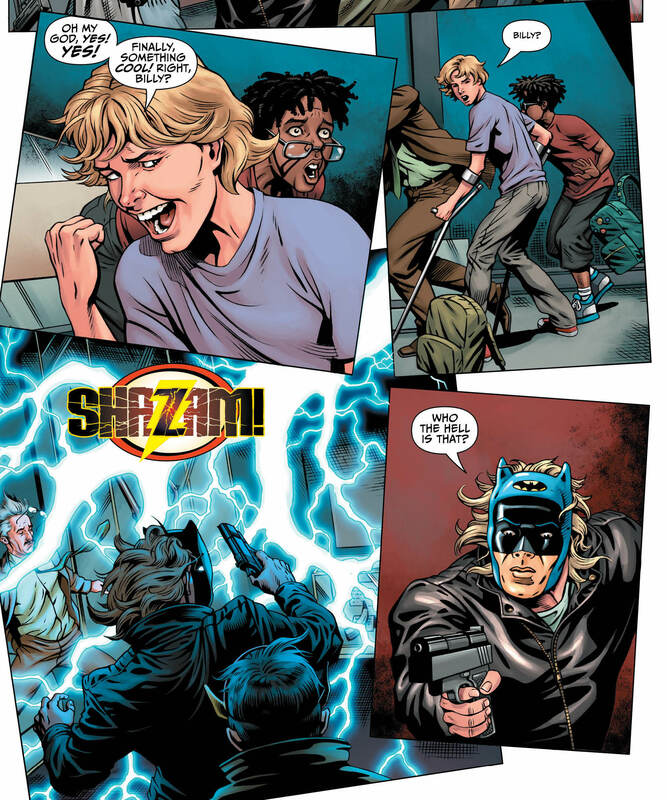 There’s the trademark sense of charm and wonder that Billy’s comics are known for and while it isn’t quite the same as Grant Morrison’s masterful The Multiversity: Thunderworld, it still has that to it. The book also carries the DNA of a lot of great all ages fantasy adventure novels and stories. From The Phantom Tollbooth, Narnia, Wizard of Oz, Alice of Wonderland to the works of Roald Dahl, the creative team definitely manages to channel the spirit of stories in that fashion. However, intended or not, there’s also a great manga sensibility to the work here. Johns is no stranger to such a sensibility, with a lot of his work carrying it, but this is perhaps the most overt one to do so. The work here is very reminiscent of classic Fujiko Fujio works, especially the 60’s Perman stories they produced. This sense is further aided and cemented by the lovely backup story by the Japanese artist, Sen. The backup is a touching and sweet story showing us the origin of Mary and how she came to be where she is. We’re also introduced to Hoppy, a bunny Freddie and Mary rescue from a store planning on selling him to Dr. Sivana. The rescue really ends up being the moment the two bond for the first time and truly become family. Drawn and colored by the phenomenally talented artist Sen, a massive fan of the franchise and character, it brings a fitting manga aesthetic to the book. It’s much more cartoon-y and aiming to be artistic more so than ‘real’. It carries the story incredibly well, being so suited to it, down to the very tonality. The last moments of the backup connect with the beginning of the main story, as we see Mary and Darla get a call from Freddie and transform, before heading off to the museum. But before it ends, we see Hoppy get struck by a spark of magic lightning. His eyes glow with power as Kirby krackle and lightning surround him. His fur has now shifted to become a lightning pattern on both sides. He’s Shazam bunny now. This is very clearly an update on Hoppy the Marvel Bunny for the contemporary era. In any case, Shazam! is a delightful romp and a firm foundation for the franchise. The creative team has set us up for a great adventurous voyage through the seven magic lands and the ride begins here. This is where you get on the train, because the fun is only just starting. Evil worms, mad scientists, magic tigers and bunnies and even Santa, there’s a lot on this ride, so get your ticket and hop on-board.